Welcome back to another week of Fantasy hockey. We’re into mid-November now, things are beginning to heat up in your leagues and there’s still tons of help to be had on the wire. This week, those of you that expected Jet blueliner Josh Morrissey to get suspended for hurling T.J. Oshie to the ice were wrong (speaking of betting, if you’re seeking a list of the top accredited betting sites in the world, check out casinoencyclopedia); former women’s Olympic hockey star Lyndsey Fry has been hired as a special advisor to Coyotes’ CEO Ahron Cohen; and Nashville, already dealing with serious injury issues, has now lost both P.K. Subban and Viktor Arvidsson to the IR. 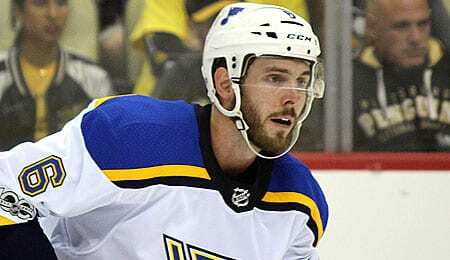 Joel Edmundson, D, St. Louis Blues (ESPN: unowned; CBS: 7 per cent): Edmundson is the kind of player that can help owners in deeper leagues in multiple categories. He’s more or less improved offensively each season, and now at the age of 25 with well over 200 NHL games under his belt, he’s coming into his own as a top four defenceman. Edmundson is already +5 this season, but we really like the fact that with penalties in four of the last five games, he’s now averaging over a minute. He’s also near the leaders with 25 blocks and 2.6 hits per game. Edmundson doesn’t offer a ton of offensive upside, but he plays a physical game and is not prone to many mistakes. Plus, he’s shown a willingness to play for his country (see video below). Louis Domingue, G, Tampa Bay Lightning (ESPN: 1 per cent; CBS: 32 per cent): With Andrei Vasilevskiy out for the next 4-to-6 weeks with a broken foot, Domingue has been thrust into the No. 1 role for one of the NHL’s best teams. Domingue has had some shaky starts this season, but has looked a bit better lately, especially in his last two games. He was solid as the Lightning’s backup last season, but has been burned for more goals so far this season. Still, he needs to be picked up as long as Vasilevskiy is out. Tanner Pearson, LW, Pittsburgh Penguins (ESPN: 2.2 per cent; CBS: 18 per cent): Pearson was off to an ugly start with the Kings this season, but has now been traded to the Penguins. He immediately saw an uptick in ice time in his Pittsburgh debut, going +1, and could skate on a line with newly returning Derick Brassard and Phil Kessel (or perhaps in time skate on either Sidney Crosby‘s or Evgeni Malkin‘s wing). Given that Pearson scored 24 goals two seasons ago and had a career-high 25 assists last season, a change of scenery may be just what the doctor ordered. Leo Komarov, RW, New York Islanders (ESPN: 0.2 per cent; CBS: 3 per cent): Komarov seems to have rediscovered his game since signing a four-year deal with the Isles last summer. On Thursday, he ripped a goal (the game-winner, to boot) and an assist, while recording a +3 with a pair of blocks and five hits. You’ve got to love that physicality! On Tuesday, he dished out another four hits with an assist and he’s on pace to match his personal best with 36 points. Ryan Dzingel, C/LW/RW, Ottawa Senators (ESPN: 28.2 per cent; CBS: 31 per cent): Dzingel just keeps getting better for the Sens. Despite firing three shots Thursday, he had a five-game point streak snapped, and he’s become a key cog of Ottawa’s hottest line, with Matt Duchene and Mark Stone. Dzingel’s an UFA this summer and his price tag keeps going up. Blake Comeau, LW, Dallas Stars (ESPN: 0.4 per cent; CBS: 1 per cent): Comeau isn’t being counted on for much offense in Dallas (although he did manage 34 points with a +5 rating last season in Colorado), but he can offer help in other areas. With three takeaways on Friday, he now has a dozen on the season to go along with 56 hits and six blocks. Comeau is playing a key role on Dallas’ shutdown defensive line. Expect his +/- to improve as the season progresses. Ben Hutton, D, Vancouver Canucks (ESPN: 0.8 per cent; CBS: 8 per cent): Hutton looked like an up and coming star after his first two years, earning a two-year, $5.6 million deal that ends after this season. Well, last season was a disaster, but with his early play this season, he’s setting himself for another big payday. Hutton’s looking like a DFS darling as well, as his salary has not caught up to his production yet. But he’s seeing more action lately and already has four goals in 19 games (one shy of tying his career high). David Rittich, G, Calgary Flames (ESPN: 14.6 per cent; CBS: 26 per cent): With starter Mike Smith struggling, Rittich has been getting a bit more action and could see even more if he keeps delivering. Rittich has been a tad inconsistent himself, but last Saturday he shut the Kings out on 21 saves for his fifth win of the season (for context, he had a career high eight victories last season). With a .935 save percentage, he’s providing the Flames with some solid work, and periodically stealing wins (like on October 21, when he saved 44 of 45 shots to allow Calgary to win a game in Madison Square Garden Calgary had no business winning). British rockers Queen were among the dominant bands of the ’70s, becoming superstars by the middle of the decade. On its 1973 debut, eponymous album, the very first song was “Keep Yourself Alive,” setting the tone for a phenomenal career. This entry was posted on Saturday, November 17th, 2018 at 4:38 pm	and is filed under HOCKEY, RotoRob, The Wire Troll. You can follow any responses to this entry through the RSS 2.0 feed. Both comments and pings are currently closed.